Last week Sunday we had to put down our old lady. This was a very hard day for me (actually all responsibility and decision fell on my shoulders). She fell few days back and broke her back leg bone we tried to still rescue and we accepted a surgery for an implant and a vet was willing to do it even if she was old for any sort of surgery. We made it, the surgery was a success but the calcium loss in her bones literally dissolved under the implant causing her large pain so after the surgery 3 days we had to say our goodbye to her. The day before - she gifted me with her last purr, a goodbye purr when I tried to inject water in her mouth. I just wish I would pay more attention to that purr, it was weak and hardly heard - but a purr for me. I'm sorry. It sounds like she may have had some sort of cancer. The cancer at my mom's bones up like that too. TamanduaGirl wrote: I'm sorry. It sounds like she may have had some sort of cancer. The cancer at my mom's bones up like that too. Possible, but it not shown any previous sign of it. While we were hoping the surgery will succeed this just came as a hammer on the face 3 days after. Our vet was wonderful, he even said if he would see 5% chance for her to live he would go, and he gave us a compliment that we took the surgery instead of put her down to avoid the cost and the trouble - and was sorry that it won for us 3 days not more. He did not charge any additional cost for the put down, the infusion, the last medication either. He also for free helped us to handle the funeral through his connections. The signs of cancers that can effect the bones like that can be really subtle until something like a minor fall happens and the bone breaks. Sorry the surgery didn't buy more time. We did buy 6 months for my last cat when we had a big tumor removed but it came back in her liver. She was 17 too but it's always hard no matter the age. Glad your vet was good with you. TamanduaGirl wrote: The signs of cancers that can effect the bones like that can be really subtle until something like a minor fall happens and the bone breaks. Did not know that thank you for pointing it out. We had not just a little inside family drama where my mother kept pointing fingers at the vet that he should have seen the bone issue at her surgery (I believe she wanted to blame someone for the surgery cost which was sadly useless) I will tell her to calm down, such issue can not be recognized that easily. I am so very sorry to hear the loss of Sissy. 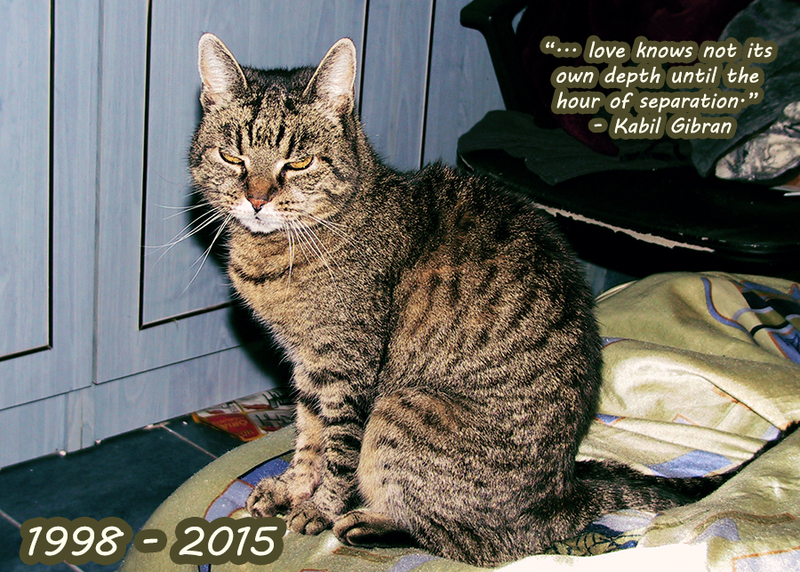 I can understand how devastating it is losing our beloved pets. sissy lived a good life and you did everything you could to help her.